The species is widespread in most of southern Britain, becoming more scattered as far north as central Scotland. It is widespread in western and central Europe. This species is found in woodland and bushy areas. It is easily recognisable by the distinctive arrow-like markings on the abdomen quite unlike any other British species. 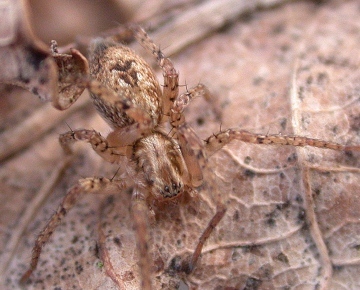 The spiders hunt and mate on the leaves of trees and bushes. During courtship the male is known to emit a high pitched buzzing sound by vibrating its abdomen on a leaf. This sound may be inaudible to older people. Adults of both sexes are mostly found in early to mid-summer with females sometimes surviving through to the autumn. Immatures can be found in ground vegetation, leaf litter and under bark in the autumn and winter. Common and locally abundant especially in the south of England.